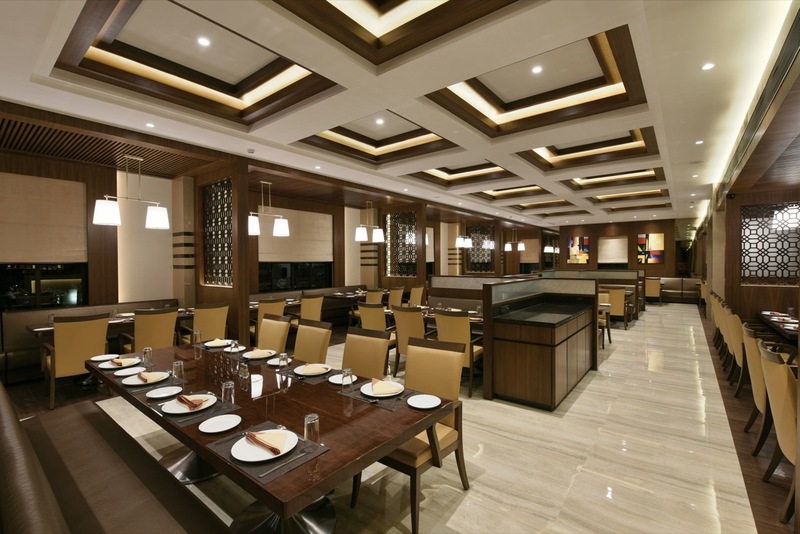 Conceived as a comfort-oriented restaurant, with classic aesthetics and relaxed ambience, Flavours’n’spice has been designed in a modern contemporary style for a gymkhana (sports club) in Mumbai. With a client brief of a day and night, fine dining restaurant to accommodate 110 people along with sufficient private and group dining spaces for all age groups, the creation of a warm and relaxed atmosphere was of utmost importance to enhance the dining experience of the patrons. The overall design intent therefore attempts to create a timeless design using an organic approach that brings the nature outside into the indoors. 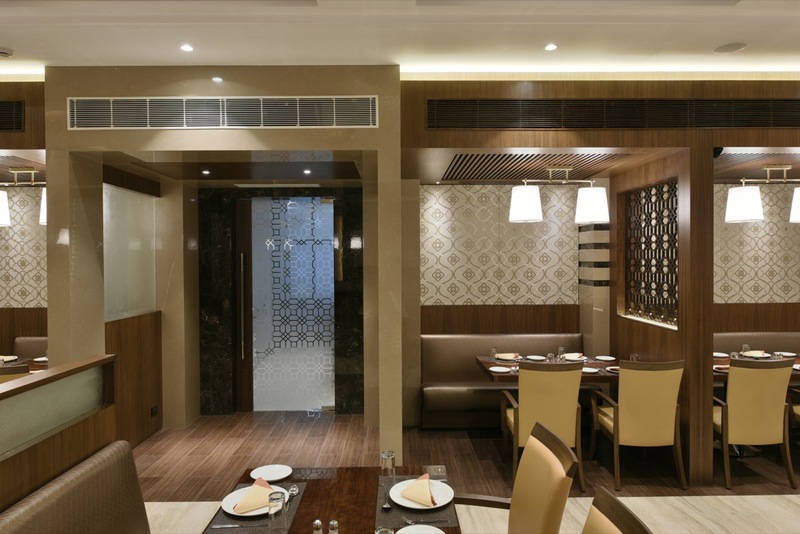 An elegant, earthy colour palette is used in the interiors to further augment the warm, relaxed and cosy aesthetic that is typically seen in old English Restaurants, while the décor is inherently contemporary Indian in style. Envisioned as a contemporary expression that is designed around layers of earthen tones, an upscale, yet warm & inviting guise has been achieved. 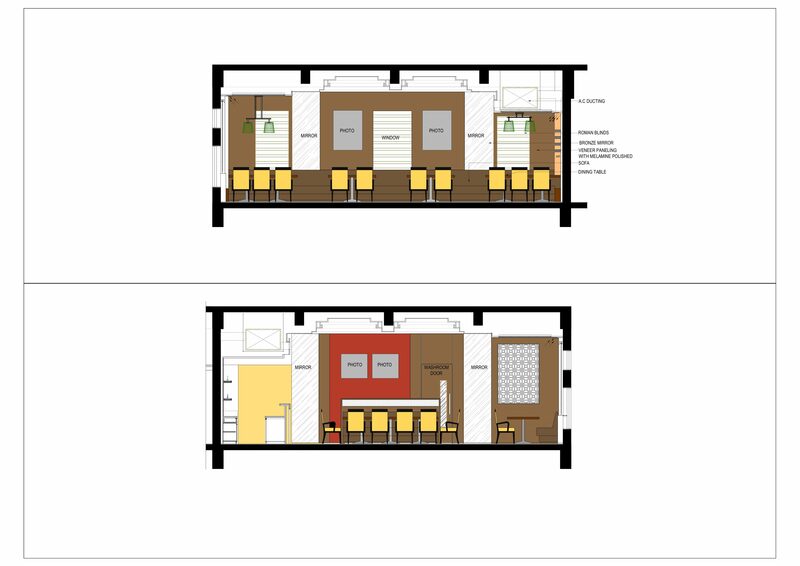 Keeping in mind a seamless work-flow between diners and staff, the layout has been designed to facilitate the same. Varied seating has been provided for large & small groups, with enhanced privacy by means of decorative, laser-cut partitions that are not only functional, but also intricate in design. 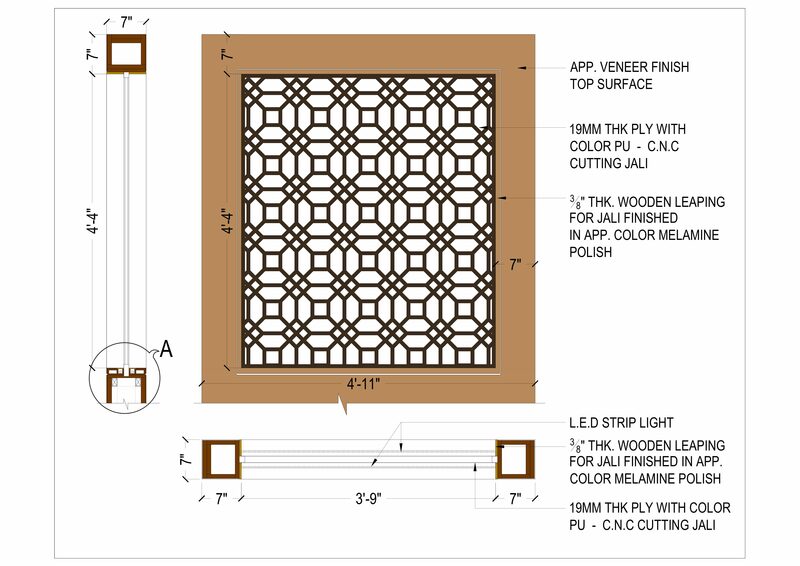 These panel screens with delicate detailing provide visual barriers for separate seating groups, and are incorporated with LED strips that light them up from below, crafting a dramatic look for the evenings. There are tables for 4 and 6 people, which can be joined together to form a seating for a larger group of 10 people. Similarly, there is a large private corner for 20 people, who can enjoy a group gathering, undisturbed. The island seating in the centre has seating for 4 and 6 people and cleverly accommodates food stations that are well- integrated with the design. The restaurant also accommodates a stylish bar at one end. The entrance to the restaurant creates the first visual impact for a diner. Ensuring an un-cluttered entrance and complete privacy for the diner, a grand glass door opens into a foyer that leads the visitor to the huge restaurant inside. The original height of the ceiling has been retained to its original height to set the stage for a stylish fine-dine look, while endowing the space with a larger volume. The wooden ceiling lends a traditional experience of being connected with nature and creates a warm, and cozy space for diners. 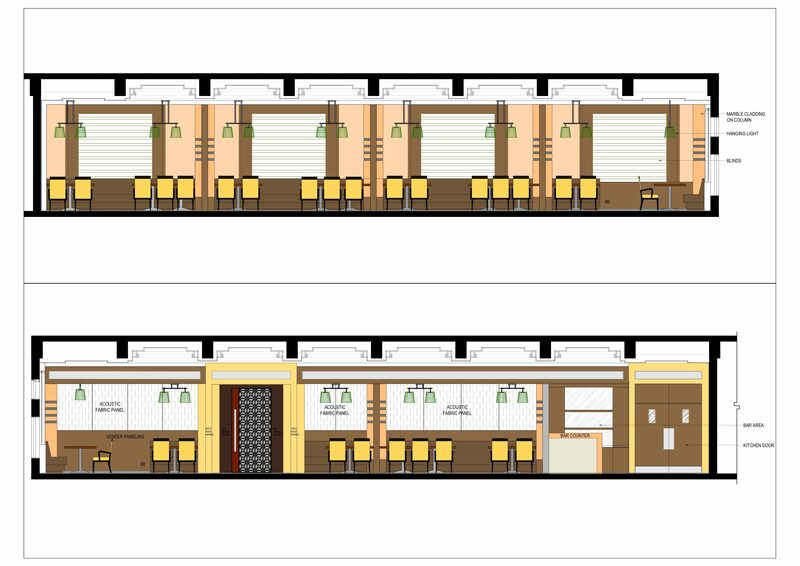 The AC ducting has been restricted to one side along the length of the restaurant, thereby retaining the ceiling height in most part. 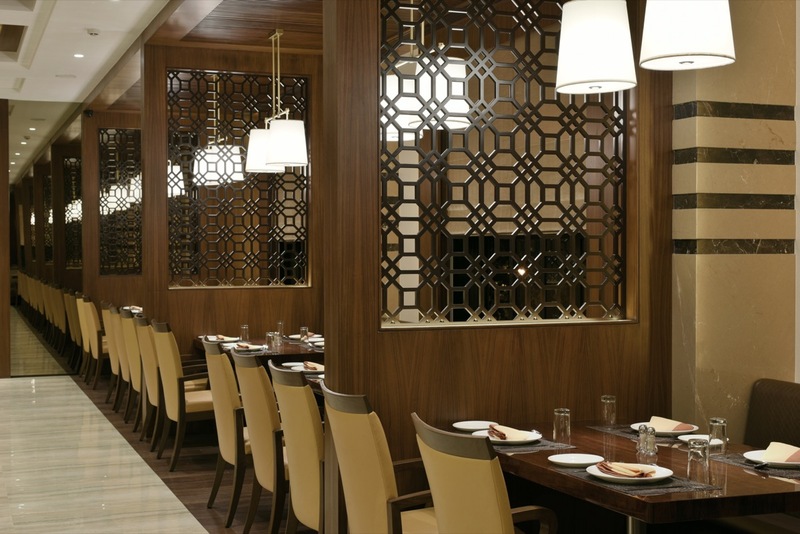 Brown tinted mirror panelling on opposite ends of the restaurant hall create the effect of a larger space and add depth and a feel of openness to the 2000 sq.ft restaurant. Each detail of the restaurant from the décor, and seating to the artwork, contributes to the restaurant’s relaxing and comfortable vibe. 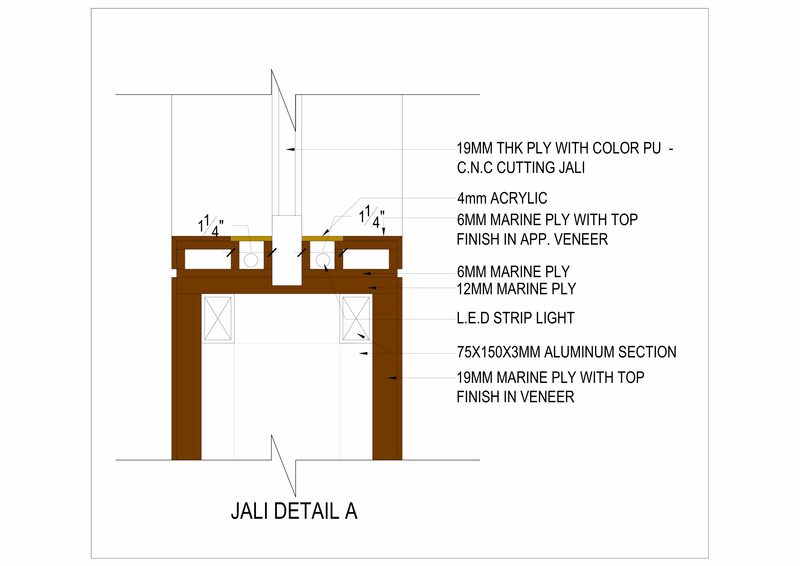 Sound proofing and acoustics play an integral role right from the conceptual design stages. Sound absorbing elements such as a wooden ceiling, acoustic ceiling sheets and decorative fabric panels on the wall ensure that all overpowering sounds are eliminated. The fabric panelling with rock wool filling provides an interesting backdrop for the seating along the length of the restaurant, while absorbing sound significantly. 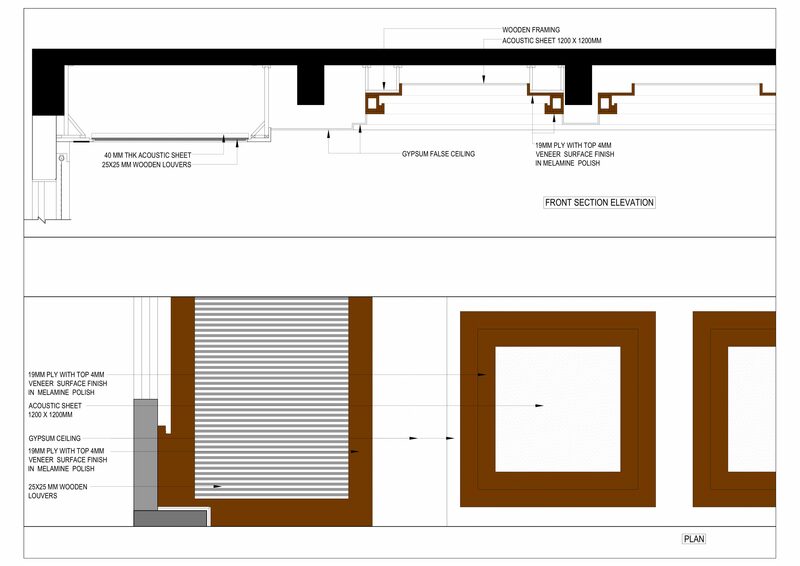 The ceiling above the seating along the length of the restaurant is lower & is clad with wooden strip panels. The panels are insulated with rock wool from inside, which act as sound absorbers. High performance sound-proof ceiling by St Gobain in the centre, eliminates unnecessary sound. Sound-proof panels have also been installed inside the coffers in the ceiling. Carefully planned Lighting in the heart of the space is indirect, to fashion an intimate, yet inviting ambience. The coffers in the central ceiling have indirect lighting, while pendant lights specifically designed by GA design for this restaurant, have been used above tables that are placed along the length of the walls on either side. 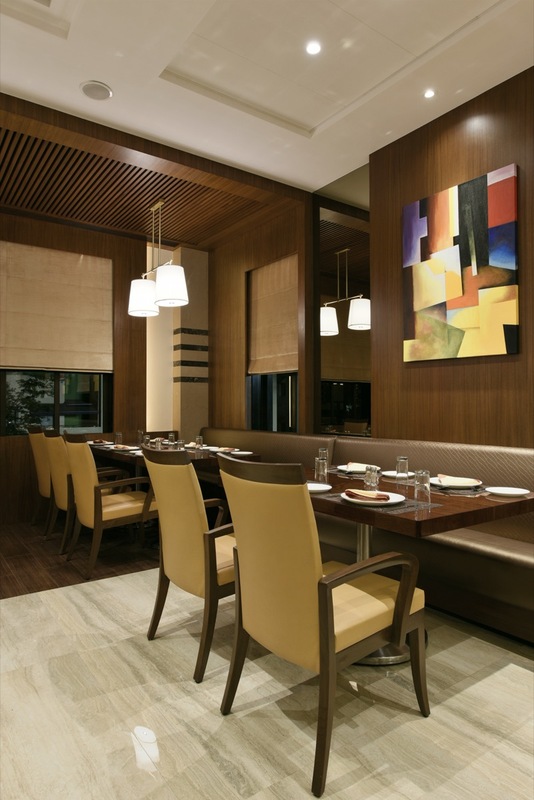 Warm lighting effects set the mood and interesting artwork serves as a point of interest for diners. 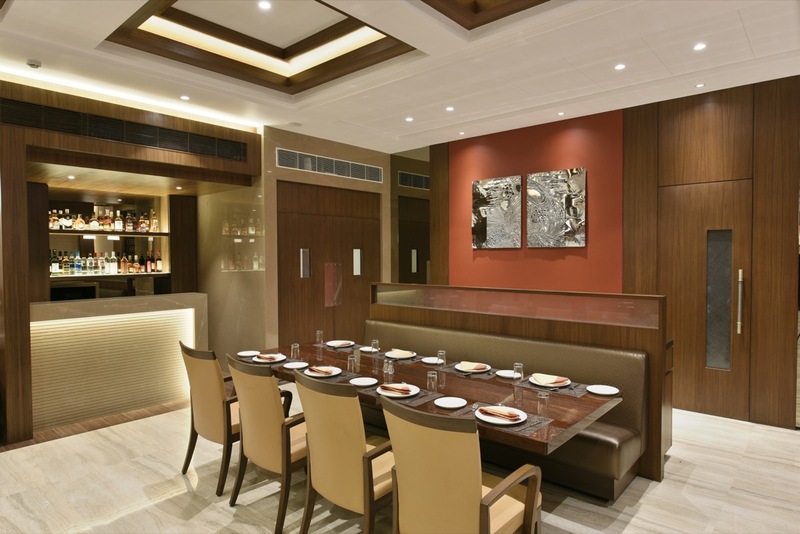 An earthen red wall at one end displays exclusive metal art while the wall at the opposite end has colourful artwork. Both these art pieces were thoughtfully designed keeping the concept of interiors in mind. The extensive use of natural materials such as wood, stone, leather and linen fabric together with the earthen tones of décor complements the surrounding natural environment beautifully. Antique Beige Italian marble on the entrance archway and columns compliments beautifully with Irish Brown horizontal slits on the columns. 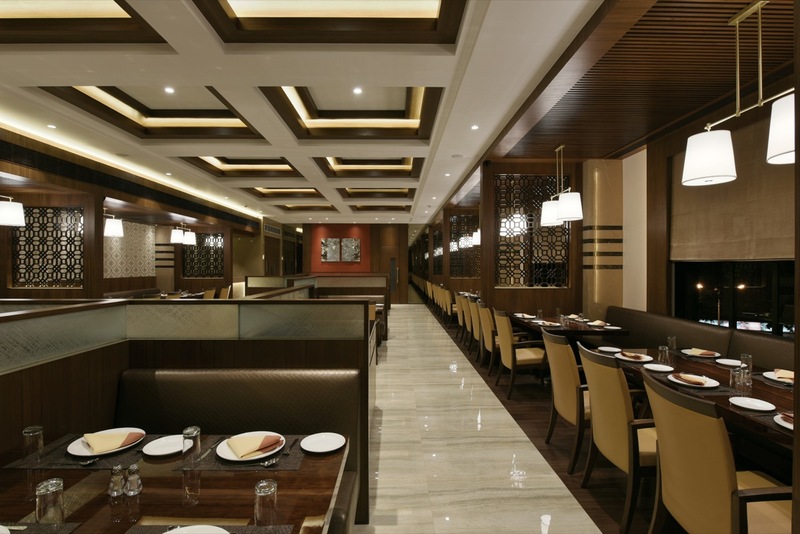 The flooring is a combination of vitrified tiles in the central area and wood finish tiles on either side along the length of the restaurant. 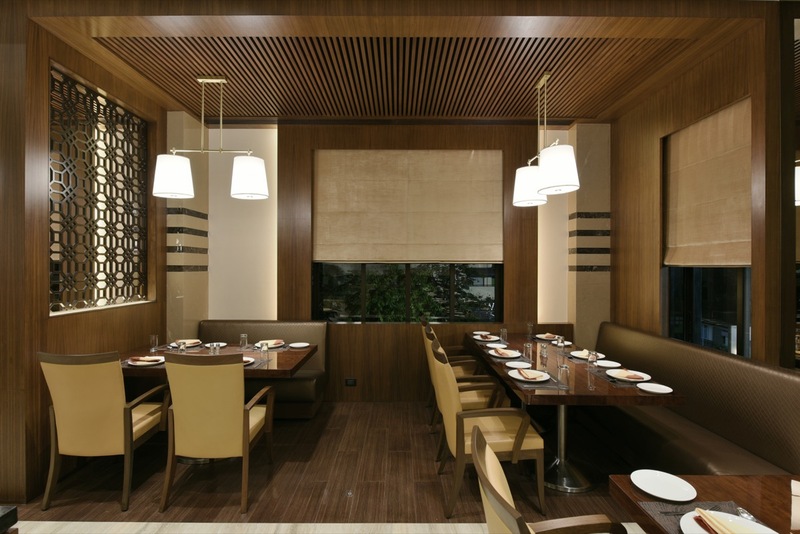 Low wooden stripped ceiling above the wooden flooring makes for an intimate soft dining experience. 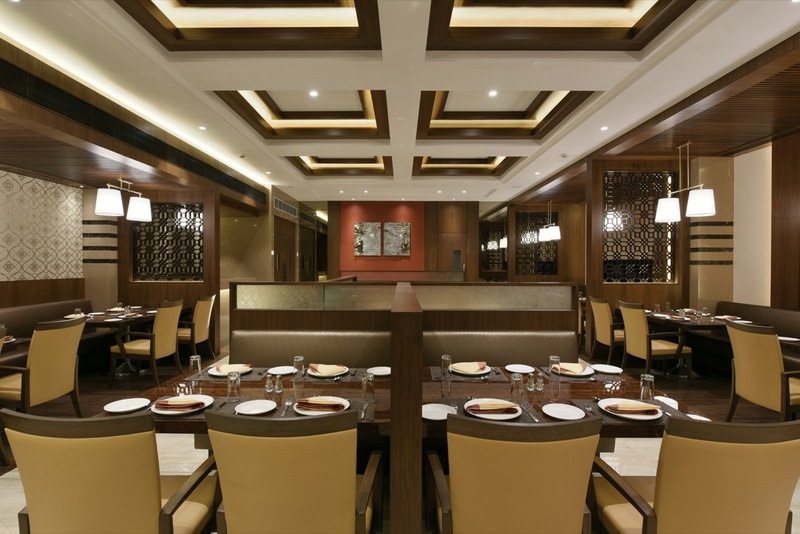 The chairs in mustard yellow leather and sofas in textured metallic taupe leather accentuate the earthen tones of the restaurant. Laminated burl veneer has been used on table tops giving it a look of rustic luxury. Restaurant environment plays a major role in the dining experience of a patron as food & décor are strongly related to a high rating by customers, than just service. 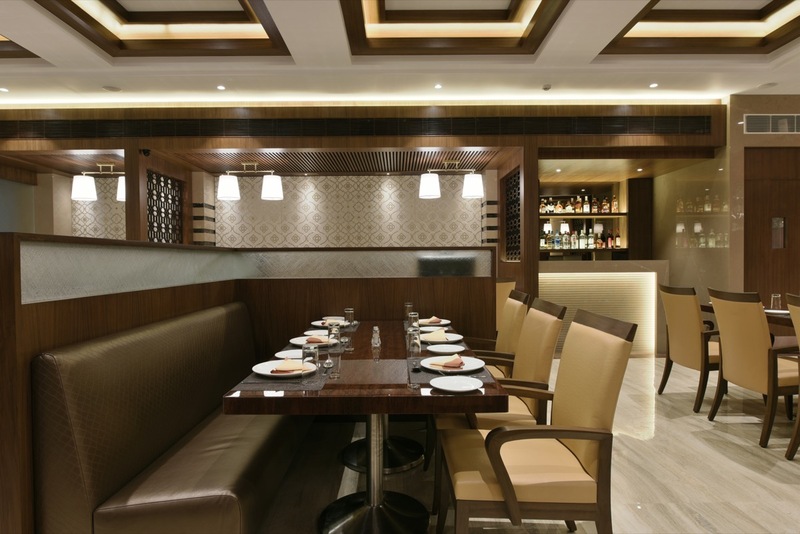 A pleasant décor, soft lighting and appropriate colours elucidate a favourable response from diners. Also, while, young people prefer bright, strong colours, adults mostly enjoy their meals in weak, unobtrusively coloured environments. The design therefore conforms to the inherent, timeless principles of restaurant, enabling a décor solution for all age groups. 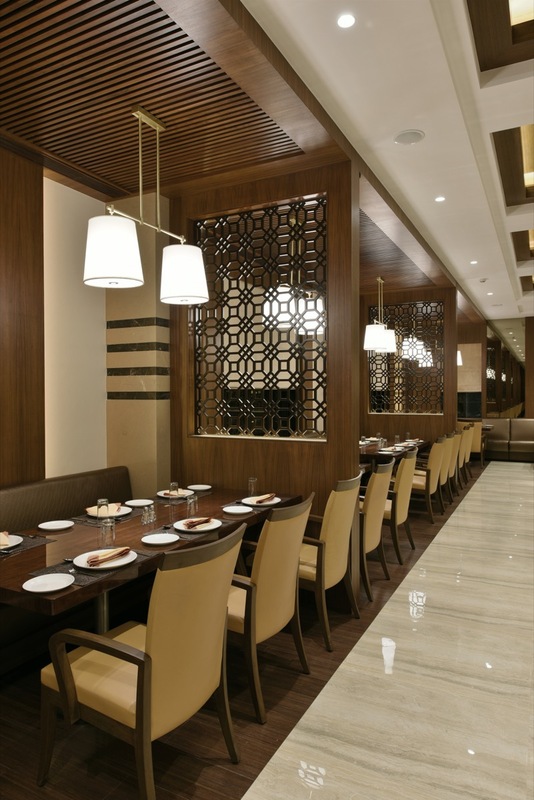 Carefully planned seating arrangements, a soft ambience and elegant décor style underpin the design of this restaurant, authenticating its unique identity in the domain of Mumbai Hospitality.